Perennially puzzled Bob Tisdale is a bit of a nutter. He doesn't accept that carbon dioxide, water vapour and other gases like methane absorb long wave radiation and prevent earth from turning into a block of ice. Anthony Watts has banned from WUWT a number of people who don't accept the greenhouse effect but he gives a platform to greenhouse effect deniers Bob Tisdale and the appalling Tim Ball (who co-authored the silly slayers book) and other people who indulge in pseudo-science and quackery. Bob Tisdale has a "thing" for Dana Nuccitelli, who is a scientist who writes for SkepticalScience.com and the UK Guardian. Bob's article is a dismal attempt to refute a recent blog article Dana wrote for the Guardian newspaper. Dana irritates Bob because Dana writes sensible articles explaining different aspects of climate science. Bob doesn't understand climate science. He doesn't understand, for example, that the world's oceans hold a lot of water. To heat them up by even a few tenths of a degree needs an awful lot of energy. "Naturally fueled" is Bob's code word for "magic". Bob is one of the utter nutters. He thinks that the physics of the greenhouse effect is a hypothesis and he thinks it doesn't hold up. These days he's in the minority of deniers. Most fake sceptics these days accept that there are such things as greenhouse gases and that the world is warming. They'll argue various things like how much the world is warming and what the future climates will be like, but they realise they'd look pretty stupid if they denied any warming at all. Bob Tisdale looks pretty stupid. The warming of the top 700 meters has also slowed to a crawl, and is nonexistent in the North Atlantic and North Pacific, but more on that later. What Bob doesn't mention at all is the Indian Ocean. 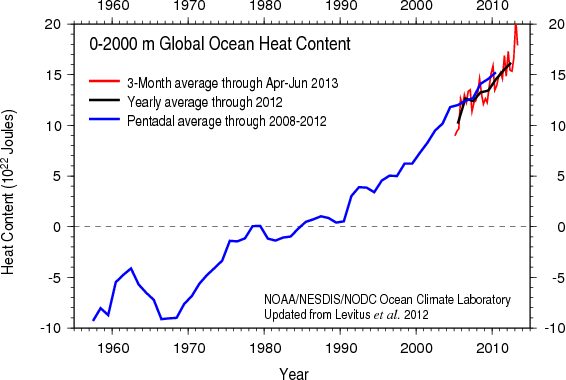 Nor does he mention the change in global ocean heat content for the top 2000 m of ocean. He tries to persuade his readers that as long as they ignore the global data and only look at the parts of the earth system he wants them to look at, they can pretend that the world isn't warming. It's like saying that if you measure the temperature of the inside of your refrigerator you can pretend that it's not 42° Celsius in the shade outside. The heat accumulating in the different oceans is added together to get the total heat accumulating in all the oceans. The chart above shows just how much the system is heating up. The chart below shows the top two kilometres of ocean. It's accumulating more and more heat. The heat from the top 700 metres is heating the layers below. Bob doesn't want his readers to know that. It is virtually certain that Earth has gained substantial energy from 1971–2010 — the estimated increase in energy inventory between 1971 and 2010 is 274 [196 to 351] ZJ (1 ZJ = 1021 J), with a rate of 213 TW from a linear fit to the annual values over that time period (Box 3.1, Figure 1). Ocean warming dominates the total energy change inventory, accounting for roughly 93% on average from 1971–2010. Melting ice (including Arctic sea ice, ice sheets, and glaciers) accounts for 3% of the total, and warming of the continents 3%. Warming of the atmosphere makes up the remaining 1%. 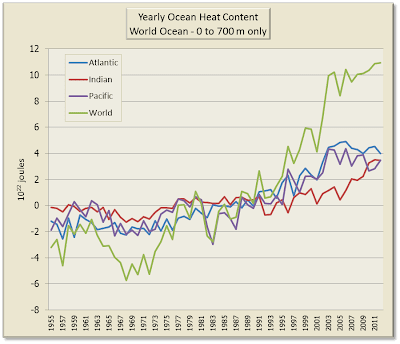 The 1971–2010 estimated rate of oceanic energy gain is 199 TW from a linear fit to data over that time period, implying a mean heat flux of 0.55 W m–2 across the global ocean surface area. Earth's net estimated energy increase from 1993–2010 is 163 [127 to 201] ZJ with a trend estimate of 275 TW. The ocean portion of the trend for 1993–2010 is 257 TW, equivalent to a mean heat flux into the ocean of 0.71 W m–2. By looking at a dataset on a global basis, one can only assume greenhouse gases play a role in the warming. As I’ve noted in numerous previous posts, dividing the dataset into smaller subsets allows the data to present how it truly warmed." Yes, Bob, if you dice and slice the data into small enough (and short enough) pieces, you can find something that agrees with your preconceptions. Absolutely correct data that does not (in context of global numbers) support your nonsense - at all. I'll note that Tisdale has had a lot of posts up on WUWT recently (seven in the last two weeks) - their already abysmal post quality is dropping even further with his work. Yes, he makes no sense. And is oblivious to how clear that is to rational people. "By looking at a dataset on a global basis, one can only assume greenhouse gases play a role in the warming"
Actually, temperature data don't allow you to assume anything about what is causing temperature rise! And whether he divides it by latitude /longitude/ ocean basin makes no difference. Looking at regional and temporal variation and tells you nothing about cause. But that's Bob, he proceeds by assumption. He has never discussed the enhanced GHE and how to warm an ocean. Bob thinks generating a graph generates an explanation...cargo cult thinking. He [Tisdale] doesn't accept that carbon dioxide, water vapour and other gases like methane absorb long wave radiation and prevent earth from turning into a block of ice. This always amazes me. GHE deniers have to explain (with real physics that works) why the surface isn't ~33K colder than it is and they can't. That should be the end of the matter, but as you say, when physics doesn't get the job done, there's always magic. And there's dear old Anthony to punt it on his "science" blog. I linked this article in the Guardian nuticelli article comments. Expect incoming from the WUWT-Taliban anti-science flashmob. I think it's "Nuccitelli". "Nutticelli" is WUWT's way of slagging him off. Dear old Bob doesn't know the difference between temperature and heat. But, what skeptic does? Bob is good at some things...actually two things: 1. Cherry-picking and 2. Ignoring the law of conservation of energy. It turns out that he integrates the SOI index to create an upward warming trend, which is the most ignorant thing to do. Now I really understand how bad that guy is at misrepresenting physics. I'm having trouble understanding the ocean heat content graphs. How can ocean heat content be expressed as a negative value? If indeed it is not an absolute value but a difference from some arbitrary heat content what is the value of that heat content? As noted in that paper, OHC is by definition an "anomaly", i.e. there is a reference point for temperature set at some date/time period. Remember that OHC is calculated from the temperature, it is not something that can be measured directly. That is correct, Anonymous, since the latter is not of relevance. It's the changes that determine what happens. 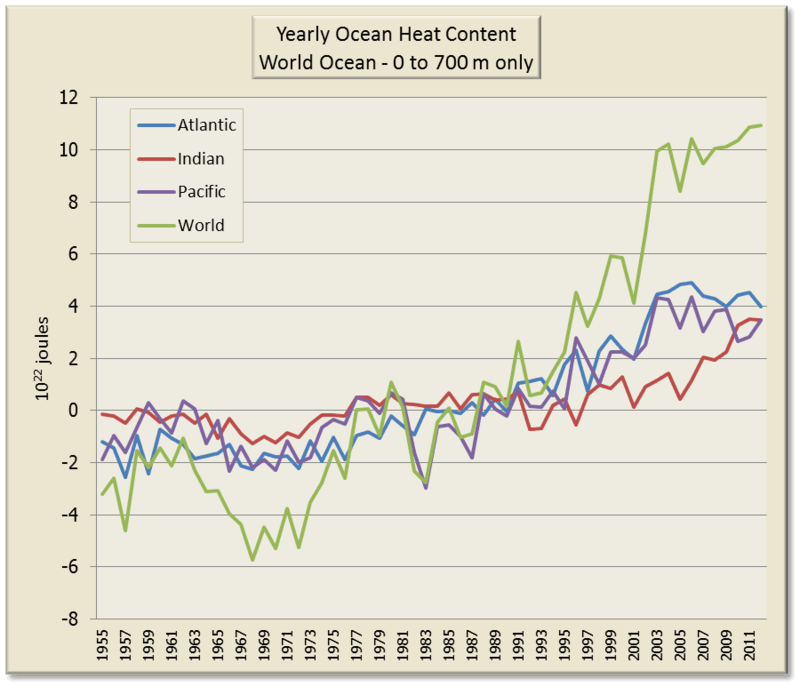 I would have thought the change in ocean heat content wrt the total heat content would be of utmost relevance and importance. If the changes are insignificant compared to the total then their effect is insignificant.